Last night I went to the local pub and ordered the biggest steak and chips they had. After I certainly felt like I had been fed. This morning when I got out of my tent the blue sky had been replaced by grey sky. It was also a lot cooler than yesterday. As I didn't have many kms to do today, I took my time getting ready and left at about 9am. Well when I rode out of Scamander it began to rain. So out came the waterproofs. At least I had a nice tailwind, so it didn't take long to get to St Helens. When I got to St Helens it stopped raining. St Helen's is a reasonable size town and is located along the coast. I stopped here for breakfast and also to get a bit of food for the next couple of days. As if the weather stays reasonably dry I'll be riding round the Bay of Fires to Gladstone. 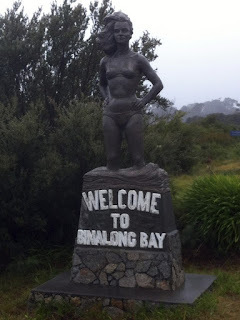 Once I finished in St Helens I rode around to Binalong Bay. 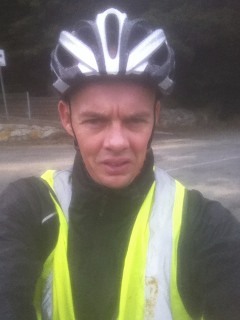 The ride was very misty and it started raining again. When I got to Binalong Bay I had a walk along the beach, before I went to the cafe for lunch. The cafe certainly is not small on their servings. 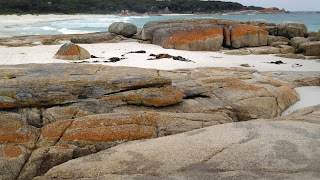 After lunch I rode upto the Bay of Fires. 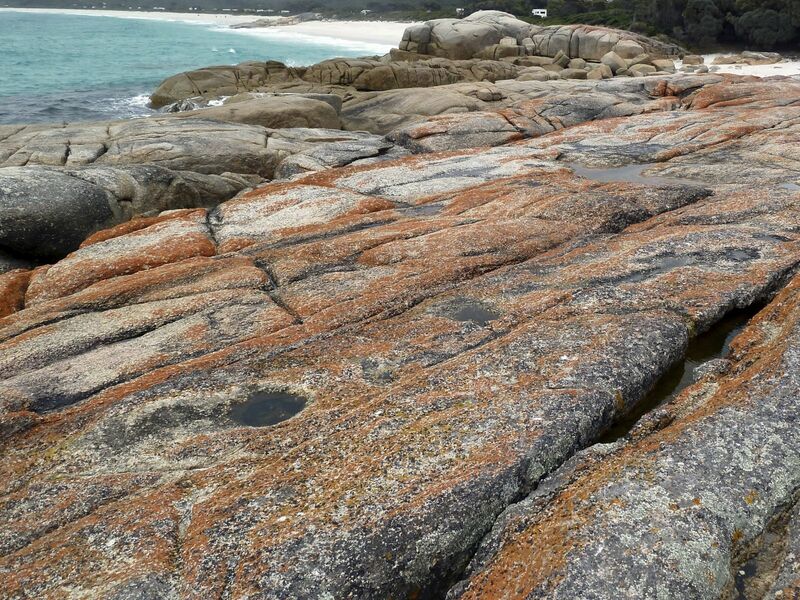 A series of beaches, coves and rocky outcrops. This area looks amazing when there is blue sky. Today there was no blue sky, but it still did look nice with the low clouds and sea mist. About 10kms from Binalong Bay I stopped at the Cosy Corner campsite. There are a number of campsites which are very accessible from the main road. My tent is again about a 30 second walk to a white sand beach. Once I set up camp I had a walk along the beaches to the numerous bays around this area. Even though the weather was average, the views were still pretty good. I then just relaxed for the rest of the afternoon. Tomorrow, depending on the weather, I'll be riding to Gladstone. If the weather is still wet I may backtrack to St Helens and take the main road instead. Let's hope the weather is good tomorrow.